One of my absolute favorite ice cream flavors is mint, especially when it's Mint Chocolate Chip or Oreo Mint. YUM!! I finally bought a copy of The Perfect Scoop by David Lebovitz and have been drooling over it since day one. 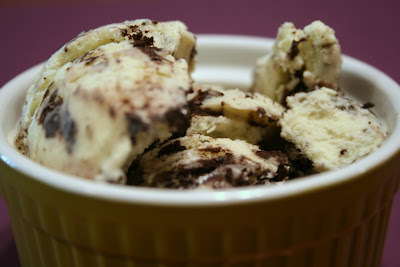 Naturally, I couldn't wait to try the recipe for Fresh Mint Ice Cream. The fresh mint in this recipe made for a very light and refreshing ice cream. Personally, I loved it, though my husband was a little taken aback by the fresh mint flavor. I did warn him that the mint was fresh and not extract from a bottle, but apparently I was too late. He didn't dislike it by any means, he just wasn't expecting it to taste so "plant like" as he referred to it. It was the "plant like" flavor that I enjoyed the most about this recipe! Warm the milk, sugar, 1 cup of the cream, and salt in a small saucepan over medium heat. Add the mint leaves and stir until immersed in the liquid. Cover, remove from the heat, and let steep at room temperature for 1 hour. Strain the mint-infused mixture through a mesh strainer into a medium saucepan. Press on the mint leaves to extract as much of the flavor as possible, then discard the leaves. Pour the remaining 1 cup heavy cream into a large bowl and set the strainer on top. Rewarm the mint-infused mixture over medium heat. In a separate medium bowl, whisk together the egg yolks. Slowly pour the warm mint liquid into the egg yolks, whisking constantly. Scrape the warmed egg yolks back into the saucepan. Stir the mixture constantly over medium heat with a heatproof spatula, scraping the bottom as you stir, until the mixture thickens and coats the spatula. Pour the custard through the strainer and stir into the cream. Stir until cool over an ice bath.